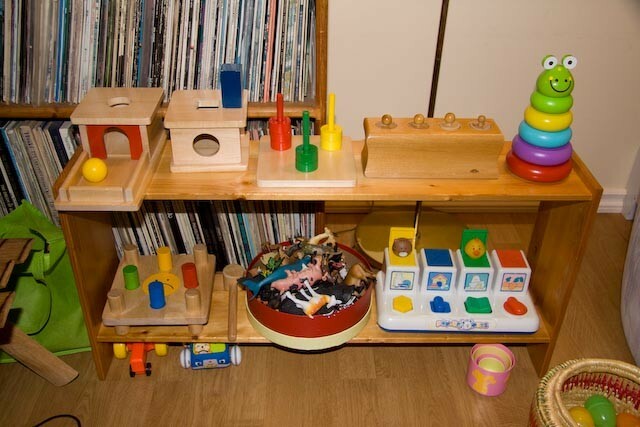 The Montessori Child at Home: At home with C. and her younger sister M.
At home with C. and her younger sister M.
This is C.'s first year at our school and her parents have made many changes in their household to foster her independence at home. 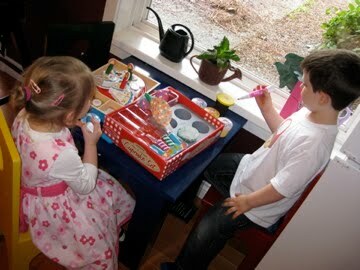 C. has a younger sister, (M.), so these changes have had to work for both children. I think they've done a marvelous job because, as you can see in the pictures, the changes work for both girls. 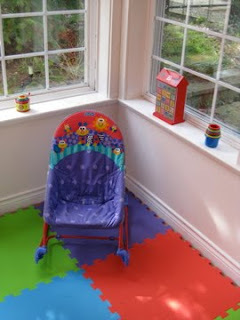 C.'s mother has graciously supplied text to go along with the photos so I'll step back and let her guide you through their home. Enjoy! 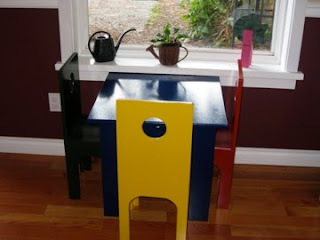 "These first two photos show a corner in the kitchen that used to be home to a TV. 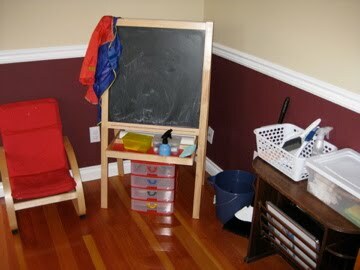 It now has an easel and art supplies, as well as child-sized cleaning supplies. 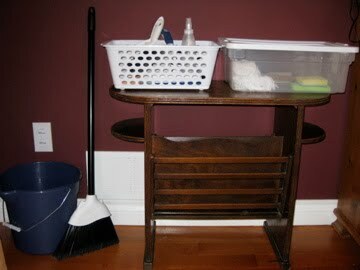 I had to dig in the basement to find the old magazine table for the cleaning supplies... 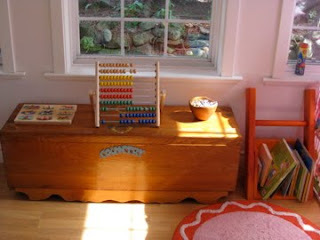 I remember it well from my own childhood! Having the TV removed from the kitchen has had a huge impact. 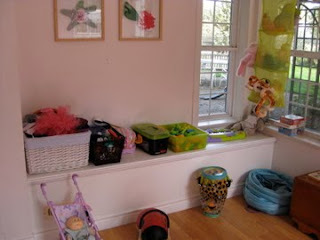 The space is now quiet and peaceful, and C. has stopped asking to watch TV and is finding more creative ways to direct her energy." and plays at this table, especially when she has little guests." which is also being used as a "shelf", and I've been storing toys and puzzles inside and rotating them. " 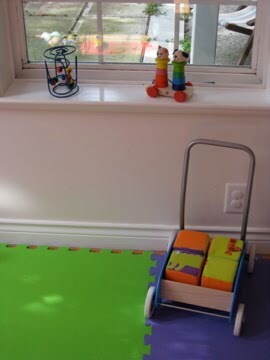 loves making a mess, so we have hid this sill behind a fabric play house that C. was given at Christmas. 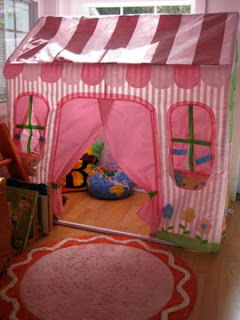 This fabric playhouse also acts as a private space for C. when she needs some quiet time." "I've added containers to our pantry for C's morning cereal. 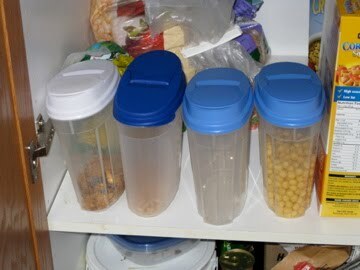 I have also bought small pitchers for the fridge for milk. Mornings are much more pleasant now that C. can get most of her breakfast herself." 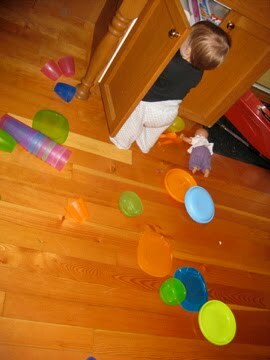 "This was C's cupboard before we arranged her new one. 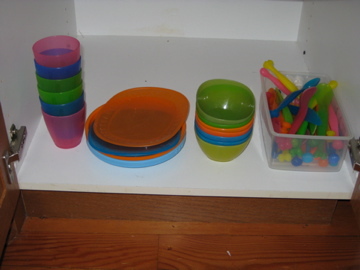 It is now used by both girls for cutlery, although M, still hasn't quite caught on to the idea of an organized cupboard. " I love M's sense of order! 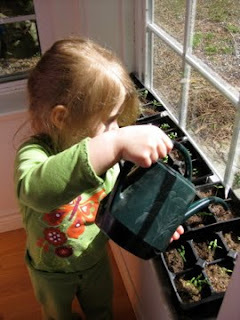 Great pic of the seedlings. C & M look like they feel right at home. Love that last pic! And I love the child-sized cleaning supply area... That table is perfect, too.